New Socialist Initiative (NSI), a collective claiming to be committed to creating a society free of economic deprivation, gender, caste, national and racial oppressions, and ecological degradation, has said that failure to introduce the “communally motivated” Citizenship Amendment Bill (CAB) in the Rajya Sabha after it was hurriedly push through in the Lok Sabha suggests the ruling BJP’s “game” to communally polarize the North East has failed. New Socialist Initiative stands in solidarity with the people of Assam, Tripura and the other North Eastern states in their heroic struggle against the communally motivated Citizenship Amendment Bill (CAB). It was only because of the resistance of the people that the government couldn’t table the Bill for voting in the Rajya Sabha after surreptitiously passing it in the Lok Sabha. This is in fact a victory for all the progressive and democratic forces of the country, who have been fighting to save and expand the secular character of the nation. While the danger still looms large and there is a strong possibility that the government may try to bring back the bill in the upcoming budget session, the mass resistance of the people has demonstrated very clearly that the evil designs of the fascists in power will not go unanswered and that the people will fight back with all their might. Perhaps it is a testimony to the success of the peoples’ resistance and the frustration of the fascist rulers that the Assam police slapped sedition charges against three prominent personalities of the state, who have been leading the mass resistance against the CAB in the state. Marxist literary critic Dr. Hiren Gohain, KMSS leader Akhil Gogoi and senior journalist Manjit Mahanta have been booked under Sections 120(B), 121, 123 and 124(A) of the IPC. In Tripura, numerous protectors have been beaten up by the police and the state government has prevented civil society delegations from neighbouring states from visiting and meeting the injured. We appeal to all the left, democratic and secular forces of the country to condemn such fascist attempts to muzzle democratic dissent and raise their voice in solidarity with protesters. Although granting unconditional citizenship to all the Hindus of the world has always been a fantasy of the RSS, there is a local context to the urgent manner in which the CAB has been pushed through in the parliament. In Assam, an exercise to update the National Register of Citizens (NRC) has been going on for the past few years. The exercise seeks to identify the genuine citizens of the country and thereby exclude illegal foreigners living in the state. In July 2018, the draft NRC was published and around 40 lakh people found their names excluded from the draft list. Out of these 30 lakh have now reapplied and they await final processing of their applications by the NRC authority. While initially it was thought that most of the excluded belong to the Bengali Muslim community, and Amit Shah even went to the extent of declaring these 40 lakh people as termites, gradually it was discovered that a substantial number of Hindu Bengalis have also been excluded. For understandable reasons, the issue created much furore in the country. But instead of tackling the issue sensitively, the government decided to engage in a politics of religious polarisation. The BJP government argued that it is the Muslim immigrants, who are the real enemy. They also told the public that the excluded Hindus (irrespective of whether they are Indian citizens or Bangladeshi refugees) need not worry because the government will be bringing an enabling constitutional amendment for them soon. In fact, such an amendment was already in the pipeline for some time. In July 2016, the central government had tabled a Citizenship Amendment Bill, according to which non-Muslim refugees coming from Afghanistan, Bangladesh and Pakistan without valid travel documents would not be treated as illegal migrants. But due to stiff opposition in the parliament as well as streets of Assam, it was referred back to a Joint Parliamentary Committee (JPC) for wider public consultation. But now, as the NRC debate came to the forefront, BJP expressed its determination to pass the bill at any cost. Even before the consultation period was over, the government forced the JPC to file a final report, despite vigorous protests of the JPC members. 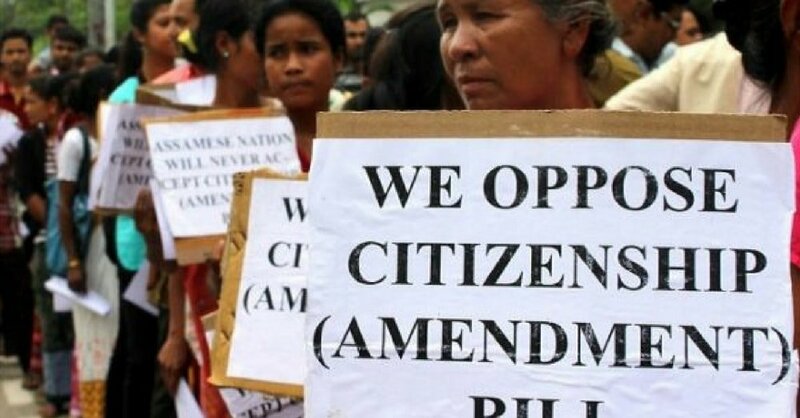 It should also be noted that while the North Eastern states are witnessing strong opposition to the Citizenship Amendment Bill, the prevalence of confusion around the objectives and provisions of the bill has proved to be a stumbling block in the process of building a strong movement against the bill in the rest of the country. More than ever, it is necessary to say it loudly that the bill has nothing to do with humanitarian concerns for the minorities in the neighbouring countries, and is all about the plan to build a Hindu Rashtra out of India. The bill very cleverly divides the citizenship seekers into two categories based on religion and excludes from its purview all non-Muslim majority countries in the neighbourhood. Rather than breaking barriers and helping the oppressed and the persecuted, the bill in effect will further solidify artificial barriers and increase religion based distrust and hostility in the entire South Asian region. In fact, it will lend a helping hand to the religious fundamentalist forces in neighbouring states to project their Hindu minorities as untrustworthy and agents of India, just like the Hindu fundamentalists have been projecting the Muslim and the Christian minorities of India as foreign and untrustworthy. As a socialist platform NSI believes in the ideal of free movement of people, ideas and solidarities across national borders. We strongly believe that the problems of communalism, religious fundamentalism, economic deprivation and ecological disaster in our region can be successfully addressed only at the level of the entire South Asia, with voluntary coming together of different nations of the region. It is a matter of much regret that in recent times there has been a consistent rise in conflict and distrust between different states of South Asia and we have allowed our politicians to indulge in fantasies of hard borders. Consistent bullying of smaller countries of the region by successive Indian governments is also a fact. But despite this, it is undeniable that a regime of people to people free exchange between different countries will be best for everyone. In fact, what we need is a bold vision, which would ensure progressive relaxation in the movement of people, commodities and resources across national borders in the entire region. This vision should also entail radical curtailment of defence expenditure by all the neighbouring nations, substantial state investment in basic public amenities and decommodificaion of all major arenas of the economy necessary for a decent human life. NSI believes in building a society where migration is voluntary and which creates no refugees. NSI also believes that we need to commit seriously towards sustaining the diversity of cultures in our country and the entire South Asian region. This requires that adequate constitutional safeguards and protections must be provided, consolidated and extended to all communities which find themselves politically, economically, and socially vulnerable in their respective regions. It is an undeniable fact that in many parts of the North East and especially in Assam, migration of people from Bengal induced by the British rulers drastically altered the demography of the region, so much so that the Assamese and other indigenous communities found themselves outnumbered in their land. This led to a long drawn out conflict and mutual distrust between the migrant and the indigenous communities and helped create a regime of what political scientist Sanjib Baruah has termed as ‘durable disorder’. NSI believes that such problems can be addressed by providing adequate and well thought out constitutional safeguards to the Assamese community and strengthening the already existing safeguards for other indigenous communities. To be sure, special care should be taken while designing such constitutional safeguards so that they do not strengthen archaic notions of ‘pure ethnic homelands’. Proper constitutional safeguards will assure the small and vulnerable communities about their future and pave the ground for easy passage of radical policies on immigration and intra-regional cooperation. Our commitment towards migrants, refugees and citizenship-seekers do not have to come in conflict with our commitment towards protecting the culture, identity and politico-economic life of the already existing small and vulnerable communities. In fact, they can complement each other. A compact association of South Asian nations, with free movement of people, ideas and commodities can be founded only on the basis of respecting and protecting the diversity of the region. It is noteworthy that while on the one hand the present Indian government seeks to divide refugees on the basis of religion, on the other hand, it has turned the clause 6 of Assam Accord (originally designed to protect the Assamese and other indigenous communities) into a complete joke. This is a sure shot recipe to disaster.